Anonymous Information: Our Website is not set up to automatically collect Personal Information (as defined below) from you. Our website automatically collects anonymous information through the use of various technologies to track certain information about the visits to our Website. Anonymous information is information that does not identify you specifically. For example, when you use the Website, we collect your IP address, which is a unique identifier that is associated with your computer. We analyze IP addresses in the aggregate for system administration purposes and to compile statistics that show the numbers and frequency of visitors to our Website and its individual pages. These aggregated statistics are used internally to improve our Website and for product development, and for marketing purposes generally. These aggregated statistics may also be provided to advertisers and other third parties. We do not link IP addresses to any Personal Information, so although your session on the Website will be logged, you will remain anonymous to us and the Website. Personal Information: In a few areas on our Website, we ask you to provide personally identifiable information that will enable us to verify whether you are entitled to access and use certain information, materials and services available from our Website, or to enable us to enhance your site visit, to assist you with customer service or technical support issues, or to follow up with you after your visit, or to otherwise support your customer relationship with GutenMarkt, Inc. It is completely optional for you to participate in these areas of the Website. Personally identifiable information (“Personal Information”) is any information that can be used to identify a specific individual, such as a person’s name, date of birth, email address, mailing address (including ZIP code), phone number and credit card information. Personal Information is collected when you purchase season passes or products or services via the Website; register for our email newsletter; subscribe to a newsletter; request to be added to our mailing lists; register for sweepstakes; contests and other promotional opportunities; or provide feedback in an online survey. As described in detail below, we may use your Personal Information in many ways, including sending you promotional materials. In addition, as outlined below, you may unsubscribe or “opt-out” of certain uses of your Personal Information. Personal Information: We will use your Personal Information for the purposes for which it was provided. For example, if you provide Personal Information to purchase a season pass at the Website, register for E-mail Updates, enter a contest, or purchase products or services, we will use it to register you for or provide you with those products or services. Subject to your ability to unsubscribe or “opt-out” of certain uses of your Personal Information, we may also use your Personal Information to provide you with information about features, products or services and other offers from our sponsors, partners, and the like that we think may be of interest to you. This information may be sent to you by postal mail, email or other means. Under certain circumstances we may post some of your Personal Information on the Website (for example – if you win a contest we may post your first name, city and state where you live on the Website). Anonymous Information: We may also use Personal Information in aggregate form for purposes of research or analysis. In order to better understand and serve our guests and the users of the Website, we often conduct research on our guest demographics, interests and behavior based on Personal Information we gather. Although this aggregated information may be based in part on Personal Information, it does not identify you personally. We may share this type of Anonymous Information with a variety of third parties, including our affiliates, agents, and current and prospective business partners. We may use Anonymous Information for advertising and promotional purposes and Website administration, and we may share such information with various affiliated and unaffiliated entities for such purposes. For example, IP addresses are used for the purposes of system administration and to provide Anonymous Information to advertisers about the volume of use on the Website, and demographic Anonymous Information may be shared with our advertisers and business partners. We may also enter into agreements with third parties that possess technology that allows the Website to customize the advertising and marketing messages you receive on the Website. This information may be shared with these third parties for this purpose. Administrative Purposes: Like many businesses, we sometimes hire other companies to perform certain business-related functions on our behalf such as hosting specific portions of the Website, maintaining databases, administering sweepstakes, mailing information and processing payments. When we employ a third party to perform these functions, that third party will only be provided with the particular Personal Information it needs to perform its function, and is required to protect the Personal Information. Other Disclosures: In addition, we may disclose Personal Information without providing you with a choice under the following limited circumstances to: (i) protect the legal rights, privacy or safety of GutenMarkt, Inc. and it affiliates or its or their employees, agents and contractors; (ii) protect the safety and security of our guests; (iii) protect against fraud or other illegal activity or for risk management purposes; (iv) respond to inquiries or requests from public authorities; or (v) comply with the law or legal process. You can use the Website without providing any Personal Information, but if you decline to provide Personal Information, you may not be able to use certain services or features. If you have previously provided Personal Information to the Website and have subscribed to one or more email newsletters or are receiving emails or other communications from the Website and you no longer wish to receive such emails, please discontinue your subscriptions by selecting the “unsubscribe” link at the bottom of any message. 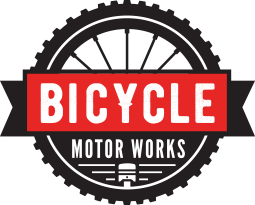 If you have previously provided Personal Information to GutenMarkt, Inc. and have subscribed to one or more newsletters or are receiving direct mail from us and you no longer wish to receive such communications, please discontinue your subscriptions by contacting us at jackie@bicyclemotorworks.com. If you ask that we stop using your Personal Information, we will honor that request. However, we will retain records of your Personal Information as needed in order to comply with applicable federal, state, and local laws. If you would like correct, change, or request a copy of the Personal Information that GutenMarkt, Inc. has collected about you, please contact the Website Manager at the address in Paragraph 10 below. We recognize the need to provide additional privacy protections for children who visit the Website. At various places on the Website, we may ask users for their age. By using the Website you agree to respond truthfully and accurately about your age. The Website does not knowingly collect Personal Information from children under the age of 13. Children under 13 years of age are expressly prohibited from submitting or posting any Personal Information on the Website. GutenMarkt, Inc. takes reasonable security precautions to secure the Personal Information that you choose to provide against the loss, misuse, alteration, or unauthorized access of such Personal Information. Unfortunately, no transmission of information over the Internet is guaranteed to be completely secure. It may be possible for third parties not under the control of GutenMarkt, Inc. to intercept or access transmissions or private communications unlawfully. While we strive to protect your Personal Information, we cannot ensure or warrant the security of any Personal Information you transmit to us. Any such transmission is done at your own risk.